The Paddington to Uxbridge section of the Grand Junction Canal was first opened in 1801. It was later connected to the main Grand Junction Canal (a direct canal from the midlands to London) and the Regent's Canal. 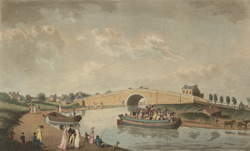 As can be seen in this print, canal boats carried not only goods but passengers, often taking city dwellers on country excursions. As well as having economic benefits, the canal was used as a location for fishing and recreational walks.